A translucent, color-zoned crystal of Fluorite measuring 3.5 cm accented by many smaller crystals on a little bit of corroded Microcline. I consider these Fluorite specimens every bit as interesting and desirable as the Beryl and Tourmaline specimens from Erongo. This specimen came labeled as being from the Irvington Quarry which is the former name of Liter's Quarry. This peculiar Fluorite specimen is from a find made about 12-14 years ago. This light-green Fluorite is a lightly etched and is topped with a cuboctahedron. It is coated on one side with small crystals of Quartz. An unusual specimen from a lesser known Chinese Fluorite locality. 8 x 7 x 4.6 cm. A Fluorite specimen with a most unusual and rare form. 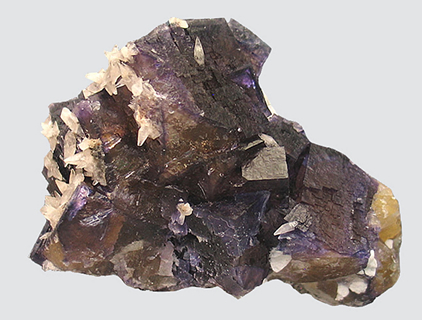 The Fluorite specimens from Afton Canyon are typically found as interpenetrating octahedrons. This Fluorite has more of a botryoidal shape to it. Both octahedral and Botryoidal Fluorite is uncommon if not rare. In several areas of the specimen you can see where it started to form as an octahedrons but didn't quite make it and ended up as rounded hillocks instead. The specimen is a little more green in color than the photos convey. It is uncommon to see material from this all but obscure location offered for sale. These Fluorites have a strong fluorescence too. 6.6 x 4.5 x 2.3 cm. This specimen is from a small find made a few years back. This specimen consists of lustrous, lilac-purple Fluorite cubes covering intersecting sprays of flattened, elongated, white Barite. 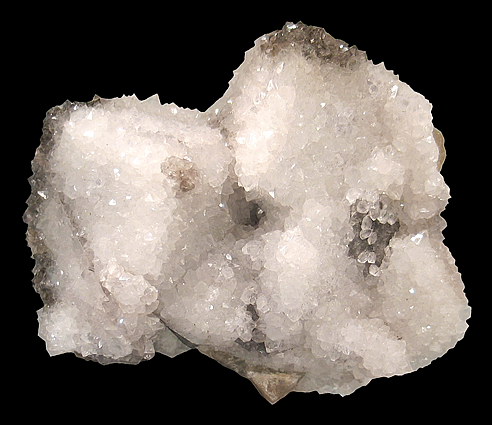 The Barite is thought to be epimorphs after Laumontite. The contrasting colors make for a very aesthetic specimen. The perceived color of these Fluorites varies depending on the color temperature of the lighting that it is viewed under. This find was documented on Season 4, Episode 4 of the television show, Prospectors. 8.4 x 6.7 x 6.8 cm. 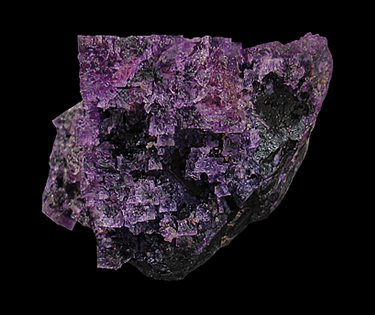 A deep-purple-colored example of Illinois' signature mineral, Fluorite. This hefty example of Fluorite has been etched resulting in the specimen having striking stepped-growth faces yet still retaining its lustre. This specimen is complete with no damage. 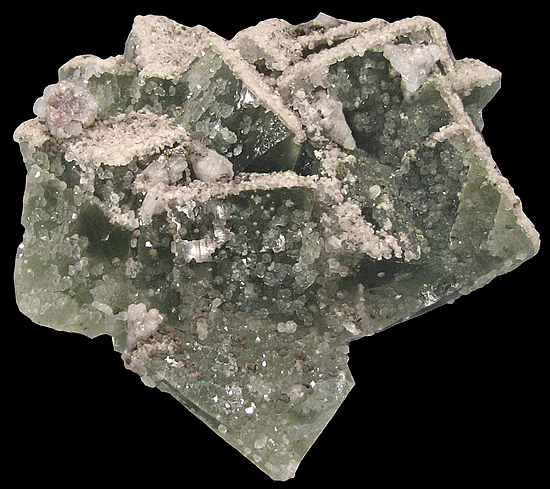 The Tower Rock Mine is one of the more obscure Fluorite localities in the Cave-in-Rock district. The workings here were shallow and the mine was never a big producer. 6.5 x 6.5 x 2.6 cm. 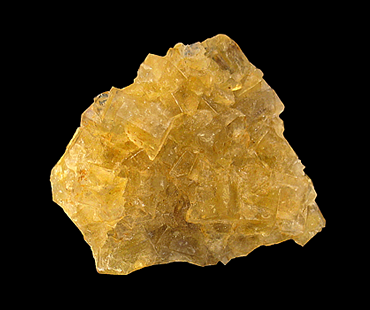 A plate of gemmy honey-yellow Fluorite crystals. The Moscona Mine was, at one time, a big producer of specimens. The supply seems do be dwindling these days and the vacuum is being filled by specimens from other locations like Berbes, Jaimina and others. 7 x 6 x 5 cm. Botryoidal Fluorite had been known from this location for years as they are distinctly different. These very unusual and interesting Fluorite specimens were collected in the early 1980's & are seldom seen for sale these days. This knobby specimen has great color and a good lustre. 8.5 x 6.5 x 3 cm. An extremely lustrous specimen of Fluorite crystals with blades of Celestine. The photo does not even come close to conveying how gorgeous this specimen is. This specimen exhibits a mottled white and gray fluorescence and is also phosphorescent. Specimens of this quality from this location are rarely seen these days. 15.5 x 14.5 x 4.1 cm. 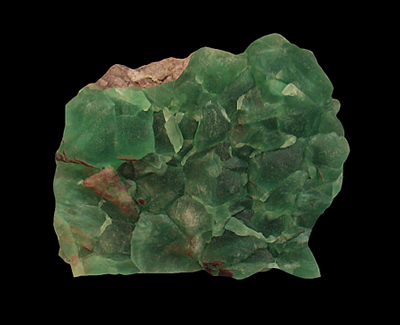 This specimen features many medium to dark-green crystals of Fluorite. 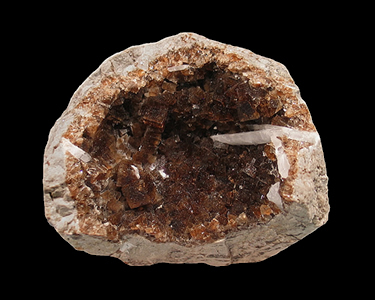 This specimen has several interesting features; the first being numerous water-clear Quartz crystals up to 3 mm. in size that cover the entire specimen. The top of the specimen is blanketed with Calcite and there are dozens of brass-colored, ball-like Pyrites covering the specimen. This Fluorite specimen is complete, with no damage. The back of the specimen is flat , but shows many growth hillocks as well as many white, needle-like inclusions. A good example of a combo specimen for this location. 9.5 x 7 x 4 cm. A very attractive cluster of bicolored Fluorite crystals with numerous scalenohedral crystals of Calcite, some of which are double terminated. 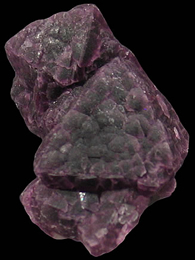 The Fluorite is intact except for a small portion of the lower left rear where it has been contacted. This is also an older specimen that was found in the late 1970's. 4.4 x 2.9 x 2.6 cm. The octahedral Fluorite crystals from the Judith Lynn Claim have become very scarce over the years. At one time it was not hard to find one for sale, but lately they're just not around anymore. 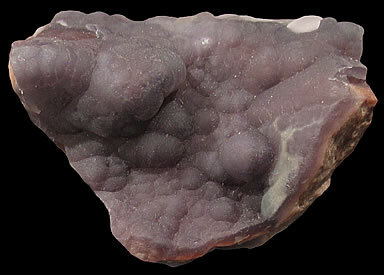 This specimen has a nice purple-red color and has an interesting bumpy, fish-scale-like texture on the crystal faces. These specimens, when you could still get them, were sold as being from Catron County to mislead potential claim-jumpers and poachers. 10 x 9 x 4 cm. This specimen features a pair of yellow and green Fluorite crystals, completely covered by hundreds of tiny Quartz crystals. The dark spots on the side and top of the specimen are due to inclusions of sulfide minerals, accenting the 3-dimensionality of this specimen. This specimen, while relatively shallow in thickness, is not broken, but rather it is contacted on the bottom where it was attached to its matrix. 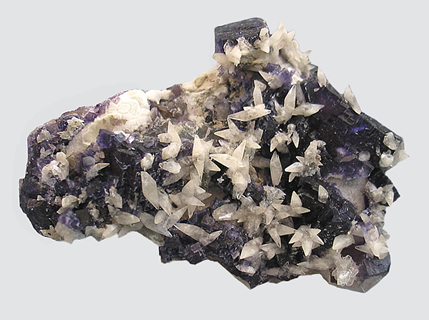 The numerous Fluorite mines in County Durham and the surrounding areas have long been renowned for their prolific production of minerals during the last several centuries.